Once again, I find that it's time for me to wipe my slate clean and move forward. I've slipped on my eating... It started out with bad choices last week, and it started spiraling out of control this weekend. I can blame work stress, I can blame anxiety over my mom's health, and I can blame being overwhelmed with the responsibilities of being a single parent. But truth be told... it's all just excuses. I know what to do, and I need to just get back on the wagon. I have a meal plan all made up... Including my Smart Ones. Truth be told, I thought about just doing the Smart Ones for breakfast, lunch, and dinner since they now have breakfast options. But I don't want to get burnt out on a good thing! I guess the lesson I keep learning is to stop beating myself up when life gets in the way of my healthy journey... It is totally possible to have a clean slate and to start over the next day. Each day that I feel guilty and beat myself up, it just makes me want to binge even more. If I would just get back up the next day, or even the next meal, and move on, it would be so much better. I'm learning. I'm growing. And it will be okay. It's all part of the journey. An occasional slip-up doesn't have mean that I go back to square one. In celebration of Cinco de Mayo, I have a product review that is perfect for those of us that want to indulge without guilt. 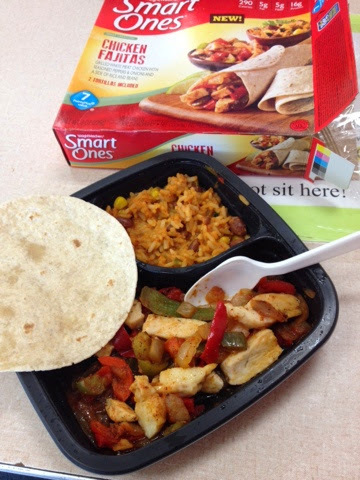 These Smart Ones fajitas were amazing! A good portion... Enough for two stuffed fajitas if you add the rice and beans like I did. So yummy! Just what I needed to hear (read) today! Thanks for sharing it! Today is a new day and a clean slate! You've got the right attitude! Get back on that horse and ride! Good luck! I know how this feels!Now I don't have as many stressers as you!i.e I am not a single mother for instance. However I totally get the "making a few bad choices and spiralling thing" I do it all the time and I seem to get super motivated and stick religiously to my diet and then make one bad choice, followed by another, and another and suddenly I've gained 4 pounds back!It's very annoying but I suppose the only thing you can do(I''m speaking to myself here I think) is curb it as fast as possible and remember why your doing it?Honestly I have yet to master this!